Before Game 1 of the American League Division Series, Josh Beckett passed along a bit of advice to Jon Lester. He told him that it doesn't matter, Game 1 or Game 3 or any old game during the regular season. "You've just got to go out there and execute pitches," Beckett said yesterday. "You don't have to do anything different." Lester did that, taking over Beckett's accustomed spot at the top of the rotation. And now, two games later, Beckett will be following his own advice. Except this time, he'll be attempting to close out the series against the Angels. It's a dream scenario, really, one the Red Sox could not have planned any better. With wins in the first two games at Angel Stadium, the Sox returned to the East Coast having grabbed the momentum and the moments. Their lead stands at 2-0 in the best-of-five series, and now comes Game 3 at Fenway Park tonight at 7:17 p.m. - with Beckett on the mound. Still, this is not quite the Beckett of last season, the Cy Young-caliber pitcher with the mind-blowing postseason. It's a Beckett who has been felled by injuries - from his back in spring training to his elbow inflammation in August to his strained oblique from Sept. 26 - and has shown a lesser grade of dominance than in 2007. 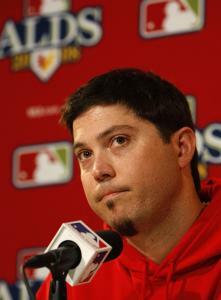 But, still, this is the postseason and this is Josh Beckett. "I think first we hope he's healthy, but second it's a great opportunity to have basically the guy we would have hoped to throw Game 1 throw Game 3," Mike Lowell said. "There's no better way to script it than to finish off the series with him on the mound." That would set the Sox up well, especially with the Rays poised for their own sweep in the other ALDS against the White Sox. It would allow Beckett - if still healthy - to pitch Game 1 of the AL Championship Series on normal rest. But that, as manager Terry Francona would say, is getting ahead of ourselves. For now, there remains the matter of Beckett's oblique, which was the reason he was pushed back from Game 1 to Game 3. Asked if Beckett is completely healthy, Francona said, "I don't know. I doubt if he's 100 percent. I don't know that anybody is. "He threw the ball really, really well [in a side session Thursday]. I don't think we would pitch him if there was a worry. I don't know that it's fair to say he's 100 percent. "If we thought we were putting him in an unfair position, we wouldn't do that." Beckett didn't couch his health or his pain, allowing his manager to worry about that. Asked how he was feeling at yesterday's press conference, Beckett said only, "I'm fine. "I think we were all preparing for Sunday the whole time. Even right after it happened, the day after it happened, the soreness was probably at its peak. That's what we were preparing for. "I think we were all pretty optimistic. We have a pretty good staff of doctors and generally whenever they tell you and keep reiterating the same thing, you start to believe it." So he will get the chance to take out the Angels tonight, what would be the Sox' third straight sweep of the Halos in the ALDS. And there is history on the Sox' side. In Division Series play, a team has taken the first two games 35 times (including all four of the series this season), and in just four of those instances has that team not advanced to the ALCS. As for Beckett, it's difficult not to believe in him, even with the concerns about his oblique. He has, after all, that oft-repeated 6-2 record and 1.73 ERA in his postseason career, with just a .159 batting average against. He is still the pitcher the Sox look to in big games, notwithstanding the emergence of Lester. Since he lost Game 3 of the 2003 World Series to the Yankees (as a Marlin), Beckett has a 1.20 ERA in the playoffs, allowing just four earned runs in 30 innings. "First of all, I think you have to be a good pitcher during the season, but the stage or the size of the game, he doesn't shrink from that," Francona said. "I think he looks forward to that challenge. "He has pitched some unbelievable games, not just the postseason, but during all of his seasons. But when you get to the postseason, he has been some kind of pitcher." discuss Bring on the Rays!